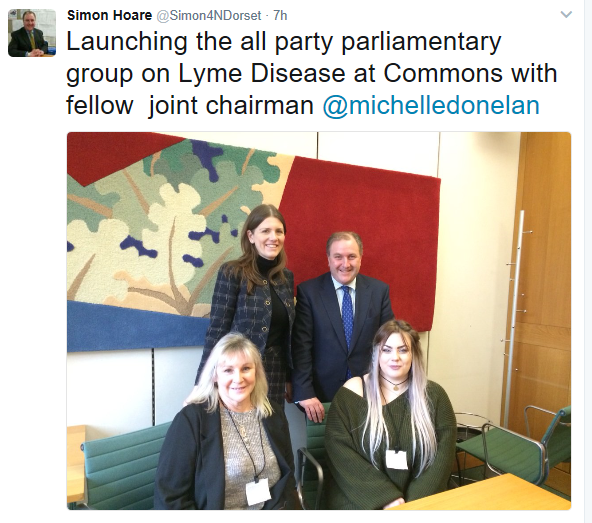 Two MPs, Simon Hoare and Michelle Donelan, have established an All Party Parliamentary Group (APPG) for Lyme disease. This follows several discussions with MPs through various patients and patient groups over many years, most recently a patient Deborah Collins who organised a meeting for MPs at Portcullis House through her MP in February this year. APPGs are essentially a safe place for MPs and Lords of all parties to discuss a particular topic in which they have an interest. They can invite anyone they wish to a meeting in order to clarify points and get a deeper understanding of an issue. APPGs are unofficial – unlike the Health Select Committee. However, they do have rules: they must have 4 officers (all MPs) including one from the government party and one from the main opposition party and must meet at least twice a year, publishing meeting dates in advance. Minutes of formal meetings are published on any website the APPG may set up, and are available on request. They can hold enquiries and ask for written or oral input, and they can produce reports of their findings. This new group will appear on the Register of APPGs when the formalities are complete.